Oh, the *dreaded* question. If you are a rising senior and older, chances are that you can relate to this. Don’t get me wrong – it’s a great conversation topic if you’re in an academic setting, or want to get to know someone else’s future plans and aspirations. But, in this post, I want to dissect the actual meanings and connotations behind the question (yeah, I’m so analytical). 1. For starters, when you get asked the question, it’s been implied that you’re going to college. If you’re going to ‘study‘ something, you must do it at some college or at least some institution. But is that really the case now for this rising generation? I mean, okay – I am biased, as I am currently taking a gap year that I didn’t agree with initially. And I’m not exactly studying to be something, but rather doing a variety of things. But the way we still see college is that it’s the bridging step between school and career. And I don’t believe that’s the reality for many anymore. There are just so many new options and paths to take, that college is almost like the ‘safe’ path to take. In short, I feel that this questions is too… antiquated. If you have a college plan ahead of you – great! But if you don’t… then it’s awkward. 2. What am I going to study? 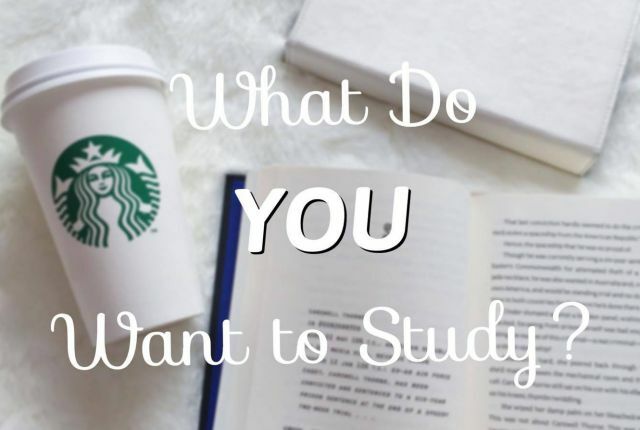 The second implication of this big question is that… you know what you are going to study. If you do – awesome (and just know that I envy your ability to settle on a career), but many people, like myself, don’t. I mean, ‘academically’, I like Psychology. And Language & Literature. And Ethnic Studies. And Digital Writing. And a few other things. But yeah, I like Psychology. 3. The question wants to put you in a box! This is such a defining question. What you want to study can say a lot about the type of person you are, your main interests, and maybe even your personality and origins. But it’s also so… limited. By choosing a subject, you’re being classified as a scientist, artist, doctor, lawyer, and so on. It’s like a label that defines you greatly. And if you are being asked this question by someone who’s just getting to know you, that’s what you’ll be to them: “Your name”, the filmmaker/teacher/dentist. It doesn’t say anything about your secondary interests, your hobbies… just what you are ‘studying’. And I know this because I’m at fault for being the person that assumes these things too. And I know this is just one question that can lead to other questions that can answer all the other things about the person that you are, but this is just a post by someone who has dreaded being asked this question for the past few years, fearing that people would classify me as that ‘one thing’. But the truth is… like everyone else, my interests evolve through time. I haven’t actually ‘studied’ a particular something as I’m not in college yet, but I have been, and am, several things at once: I’m a polyglot, a blogger, a musician, and I have a long list of activities and hobbies that define me as much as these few things. I don’t ‘fit’ into the box that this question implies, and neither should you. I love this! I recently have to choose my subjects for next year at school and choosing these subjects have been such a struggle. I have no clue what I want to be (although I am leaning towards a science field) and I just can’t choose what subjects to choose based on what I want to be. When teachers, friends and parents ask me what I want to be, I find myself in this situation where I’m panicking because I have no answer! I can relate to the struggle ? I guess a better question, instead of trying to answer what you want to “be”, is simply what you like. Just choose the courses based on your interests, and definitely ask around about how these subjects are taught, because they may turn out to be different than expected. I find it useful to also ask myself what kind of person I am, and hence what kind of things I would like to do career-wise. Eg. I love studying about how people work (which I realized when studying English Lang and Lit, leading me to Psychology), and I also enjoyed taking a higher level Math course, because I enjoyed how challenging it was. Even though my courses weren’t really ‘shaped’ into what I wanted to be, I think you’ll find that the skills you learn in each class will be useful in their own ways. I agree so much! People are so curious to what you’re doing after high school and such but they don’t seem to actually CARE they just want to know if they can pit themselves against you. They’re sizing you up… or that’s how I’ve felt it be most of the time. I think younger people are more understanding of this wishy washy feel of not knowing what you want and heck that’s okay! These are our prime years. THIS is the time to go, “You know what? I have no clue but I’m going to try everything until I do.” This is the time to just take crazy risks and do things that you might like or might not like. We’re trying to sort out who we are as a human being, it’s crazy trying to figure out how you want your career path to go to. Best of luck to you and I hope that your gap year benefits you greatly. I’ve been thinking about a gap year myself but I dunno yet haha. It’s so true what you said about people just wanting to pit themselves against you.. I’m guilty of doing that as well. I’m so glad you can relate to this feeling ? I remember watching a TED talk about someone talking about spreading his retirement across various gap years every 7 years so as to “recharge”, and I’m actually starting to see the benefits of doing that! It’s like unplugging from the system to polish who you aspire to be as an individual.